As I prepared to set off for my first (shamefully delayed) expedition to Rome, I did what any similarly literary-minded person would do and visited a local used book store in the hope of finding a decent guidebook for the benighted tourist. So deep is the true bibliomaniac’s devotion to the anachronistic and quaintly obsolete! On the way toward the back of the store, I passed by the J shelf of the literature section and saw Henry James’ Italian Hours. Perhaps the word Italian was bound to attract my attention, given my pursuit at the time; I cannot otherwise account for the fact that I found this volume about which I had never heard at the time when I would be most receptive to the lessons it had to impart. What lessons they were! I eventually found the mass-produced guidebook as well, which was excellent in its way, but no contemporary guidebook could provide the same fund of spiritual and cultural guidance for the traveler abroad whose head is full of Romantic notions, and wishes to visit Italy as an aesthetic experience. In James’ The Portrait of a Lady, Isabelle Archer progresses through life self-consciously with the aid of an intellectual, literary, and artistic framework which rendered experience a form of creation or realization. My own expectations of Rome were already largely fantastic – a curious admixture of anachronistic Classical reconstruction and semi-mythologized Romantic reception. Reading Italian Hours did little to dispel this crude and ill-formed feeling. These are the words of a man in utter thrall not just to the city itself, but to the very idea of the city. The phrase ‘the sky as blue as the most exploded tradition fames it…’ suggests that James, too, had once had his preconceptions of the city – indeed, that some of the old fanciful imaginings still knocked around in his head. That is to say, he approaches his experience of the city as a literary person. If your knowledge of Rome or of Italy more generally has been acquired solely through books, it is hard not to feel a certain resonance with James on this point. Note, also, the transition from the monosyllabic and Germanic ‘sky as blue’ to the charmingly Latinate (and perhaps even overwrought) ‘exploded tradition fames it.’ I would not press the point that James proceeded in his choice of words with the intent of looking, lexically, toward Rome, but with prose which is usually so deliberately crafted, it is not wholly impossible. Either way, the sense of being in Rome as a literary and Romantic experience can be gleaned from the use of such words as aesthetic, taste, nutritive essence, throbbing. A modern guidebook may tell you how to get to the Capitoline Museum, but could it excite you to feel the city in this way? Venetian life, in the large old sense, has long since come to an end, and the essential present character of the most melancholy of cities resides simply in its being the most beautiful of tombs. Nowhere else has the past been laid to rest with such tenderness, such a sadness of resignation and remembrance. Nowhere else is the present so alien, so discontinuous, so like a crowd in a cemetery without garlands for the graves. “The most melancholy of cities” is described using an adjective employed 27 times throughout the work. The frequent reiterations of melancholy might have you flipping back to the cover to confirm that you are not reading Robert Burton’s The Anatomy of Melancholy. Classicists, who are constitutionally charmed by the lure of the irrecoverable and ever-fading past, will no doubt feel some general sympathy with James’ general sense of sorrow for an Italy which has lost its wonder among the horrors of modernity. Few people travel to the famous Italian cities with the primary goal of seeing something new about them. The Coliseum, the Grand Canal, the Duomo – these are the lures which draw a crowd, these diminished relics of a largely forgotten yesterday. Seeing one morning, in a shop-window, the series of Mornings in Florence published a few years since by Mr. Ruskin, I made haste to enter and purchase these amusing little books, some passages of which I remembered formerly to have read. I couldn’t turn over many pages without observing that the “separateness” of the new and old which I just mentioned had produced in their author the liveliest irritation. With the more acute phases of this condition it was difficult to sympathise, for the simple reason, it seems to me, that it savours of arrogance to demand of any people, as a right of one’s own, that they shall be artistic. “Be artistic yourselves!” is the very natural reply that young Italy has at hand for English critics and censors. When a people produces beautiful statues and pictures it gives us something more than is set down in the bond, and we must thank it for its generosity; and when it stops producing them or caring for them we may cease thanking, but we hardly have a right to begin and rail. 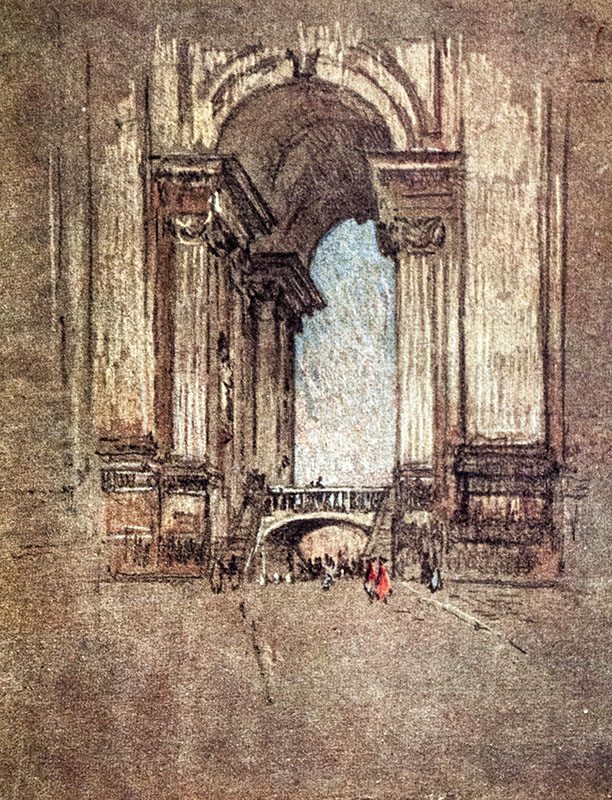 The wreck of Florence, says Mr. Ruskin, “is now too ghastly and heart-breaking to any human soul that remembers the days of old”; and these desperate words are an allusion to the fact that the little square in front of the cathedral, at the foot of Giotto’s Tower, with the grand Baptistery on the other side, is now the resort of a number of hackney-coaches and omnibuses. This fact is doubtless lamentable, and it would be a hundred times more agreeable to see among people who have been made the heirs of so priceless a work of art as the sublime campanile some such feeling about it as would keep it free even from the danger of defilement. A cab-stand is a very ugly and dirty thing, and Giotto’s Tower should have nothing in common with such conveniences. But there is more than one way of taking such things, and the sensitive stranger who has been walking about for a week with his mind full of the sweetness and suggestiveness of a hundred Florentine places may feel at last in looking into Mr. Ruskin’s little tracts that, discord for discord, there isn’t much to choose between the importunity of the author’s personal ill-humour and the incongruity of horse-pails and bundles of hay. And one may say this without being at all a partisan of the doctrine of the inevitableness of new desecrations. The beauty of the matter has been in the absence of all momentum—elsewhere so scientifically applied to us, from behind, by the terrible life of our day—and in the fact that, as the elements of slowness, the felicities of deliberation, doubtless thus all hang together, the last of calculable dangers is to enter a great Venetian room with a rush. Much of the essays in the collection consists of scene painting and the evocation of feeling. If you expected from his travelogue some tales of adventure, you would be wholly disappointed. There is here a rich appreciation for art, for literature, for life. Whether one has been to Italy or whether they will never set foot upon that enchanting land of Hesperia, James’ Italian Hours is the perfect distillation of the experience of the sensitive tourist abroad, with a head full of Classical learning and an eye firmly fixed upon the glimmering sunset of the fading past. Thanks! I didn’t initially know where I would go with this, but I have begun playing with the idea of doing more of these “appreciation essays” for non-Classical works which have some bearing on Classical reception. This one works well and the Anatomy of Melancholy post was great. I think the whole idea is good. We do book reviews for new releases, but why not for forgotten once popular tomes? When my brother and I had a music blog, I did a lot of reviews of old albums, both to try to situate them in their contexts and to try to figure out why they worked or didn’t.